Fort Jefferson. During the Indian Wars of 1790-1795, the United States built a chain of forts in the contested area of what is today western Ohio. 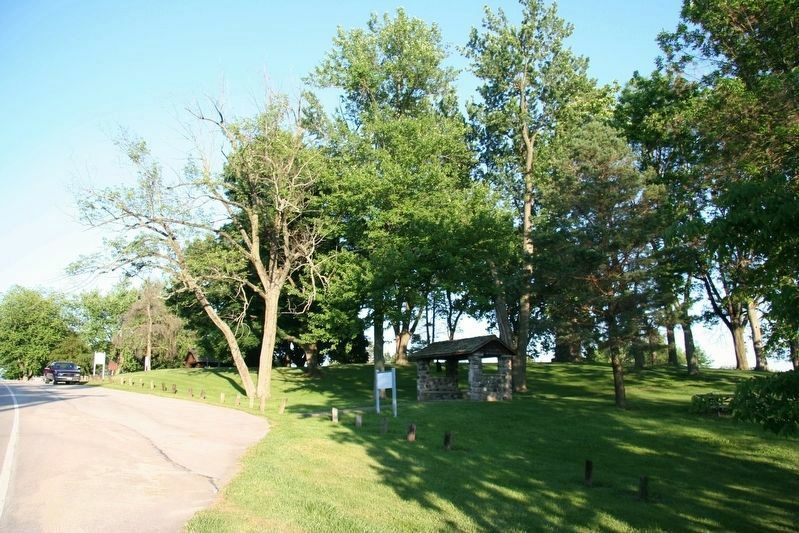 These forts were built as a result of various tribes of the region attacking the encroaching American population as they moved north of the Ohio River. 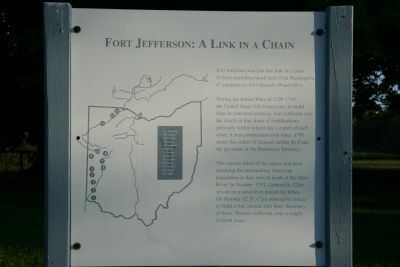 In October 1791, General Arthur St. Clair, governor of the Northwest Territory, set out on a mission to punish the tribes and on October 12, ordered his forces to build Fort Jefferson, the fourth link in that chain of forts stretching north from Fort Washington (Cincinnati) to Fort Deposit (Waterville). Each fort was generally a hard day's march of each other, and the site was chosen because of nearness to a supply of fresh water. The fort was named in honor of Secretary of State Thomas Jefferson. 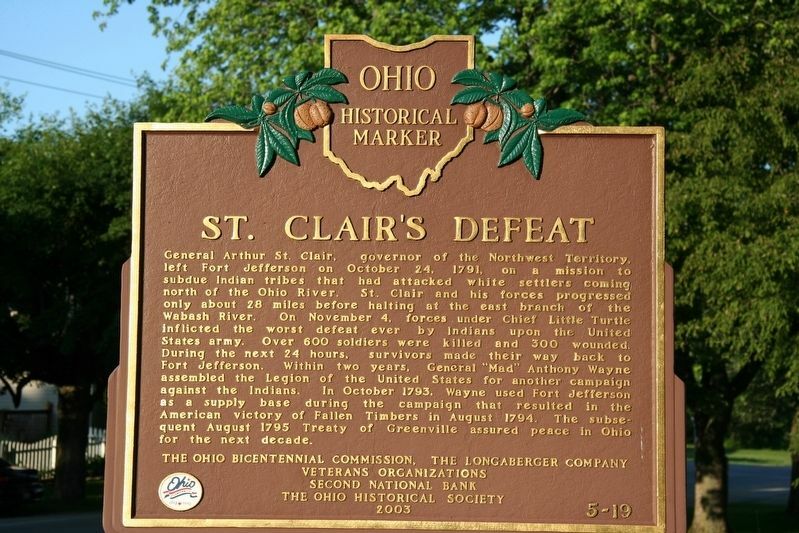 St. Clair’s Defeat. General Arthur St.Clair, governor of the Northwest Territory, left Fort Jefferson on October 24, 1791, on a mission to subdue Indian tribes that had attacked white settlers coming north of the Ohio River. St. Clair and his forces progressed only about 28 miles before halting at the east branch of the Wabash River. On November 4, forces under Chief Little Turtle inflicted the worst defeat ever by Indians upon the United States army. Over 600 soldiers were killed and 300 wounded. During the next 24 hours, survivors made their way back to Fort Jefferson. Within two years, General "Mad" Anthony Wayne assembled the Legion of the United States for another campaign against the Indians. 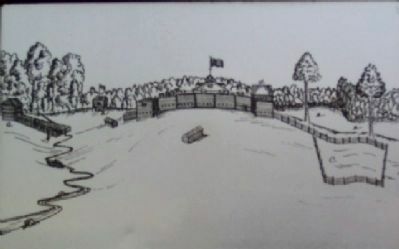 In October 1793, Wayne used Fort Jefferson as a supply base during the campaign that resulted in the American victory at Fallen Timbers in August 1794. The subsequent August 1795 Treaty of Greenville assured peace in Ohio for the next decade. Location. 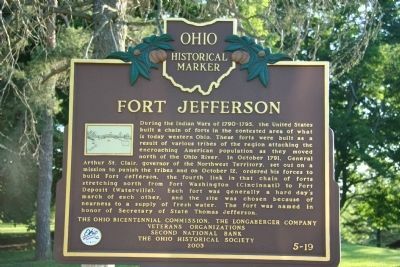 40° 1.562′ N, 84° 39.368′ W. Marker is in Fort Jefferson, Ohio, in Darke County. Marker is on Weavers-Fort Jefferson Road 0.1 miles west of Ohio Route 121, on the left when traveling west. Touch for map. 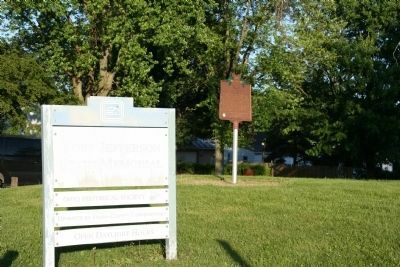 This historical marker is located in the state park maintained by the Ohio Historical Society. Marker is in this post office area: Greenville OH 45331, United States of America. Touch for directions. of this marker, measured as the crow flies. Fort Jefferson: A Link in a Chain (a few steps from this marker); Fort Jefferson (within shouting distance of this marker); Studabaker School (approx. 3.4 miles away); Fort Black (approx. 4.8 miles away); Commemorating Passage of the Lincoln Funeral Train (approx. 5 miles away); Tecumseh / Shawnee Prophet's Town (approx. 5.1 miles away); In Memory of Major John Mills (approx. 5.1 miles away); Signing of the Treaty of Greene Ville (approx. 5.3 miles away). Touch for a list and map of all markers in Fort Jefferson. This historical marker is located at the site of the Fort Jefferson State Memorial Park. View of historical marker on the grounds of Ohio Historical Society maintained property. View of marker that helps explain the role of Fort Jefferson in the American military campaigns of 1790-1795. More. Search the internet for Fort Jefferson / St. Clair’s Defeat. Credits. This page was last revised on August 21, 2018. This page originally submitted on June 25, 2009, by Dale K. Benington of Toledo, Ohio. This page has been viewed 1,204 times since then and 7 times this year. Photos: 1. submitted on June 25, 2009, by Dale K. Benington of Toledo, Ohio. 2. submitted on June 26, 2009, by Dale K. Benington of Toledo, Ohio. 3. submitted on March 15, 2010, by William Fischer, Jr. of Scranton, Pennsylvania. 4. submitted on June 26, 2009, by Dale K. Benington of Toledo, Ohio. 5, 6. submitted on June 25, 2009, by Dale K. Benington of Toledo, Ohio. • Syd Whittle was the editor who published this page.